I recently got a cheap 2-channel oscilloscope (Hitachi V-212). Judging from the "calibration not required" sticker on the front, it's been beaten up and/or neglegted (by the police, no less!) for several years. I've found the relevant service manual and have correctly adjusted the really easy things like DC offsets etc (and don't worry: I'm staying away from the high voltage CRT end). Also, the "square wave" is best visible when VOLTS/DIV is set to 5 or 10mV. This doesn't seem to agree with the "0.5V", but the service manual suggests checking x1 AC GAIN by settings VOLTS/DIV to 10mV and connecting to the calibration signal, so maybe I misunderstood something. I'm not too concerned about the second part - it's something I don't understand rather than something I want to fix... But can anyone tell me what's wrong with my "square wave"? Am I using my probe wrongly (it's an adjustable x1/x10 probe, but I have it set to x1)? Or could the calibration signal be wrong? Or is it the oscilloscope's actual measuring system? I've used oscilloscopes (some time ago) at school, so I understand vaguely how things work, but (of course) they were all in good nick so I've never had this sort of question. EDIT: Hmm, I just tried a different probe and everything looks fine (ie very slightly like the blue trace in stevenvh's example, but easily fixable). I take it that something's wrong with the probe. The distorted square wave signal (something like the top trace?) is due to a mismatch between your probe's capacitance and the scope's input's capacitance. Your probe should have a tiny screw-like slot to adjust the capacitance. Turn it until you see a proper square wave. The low level you see is probably due to the probe being set to its 1:10 position. From your description it sounds like there may be a tiny break in continuity somewhere or a dry joint, with enough capacitance present to couple the high frequency AC but ignore the DC. Wiggling the cable whilst applying calibration signal may intermittently make it work properly again. A simple way to test this would be too see if it works with a DC voltage (e.g. battery) at all. Or test for continuity with a multimeter. If results indicate the worst, the biggest suspect is probably the BNC connector junction. If you can unscrew it (not moulded) then have a look and see if contacts are bad. Not the answer you're looking for? Browse other questions tagged oscilloscope calibration or ask your own question. 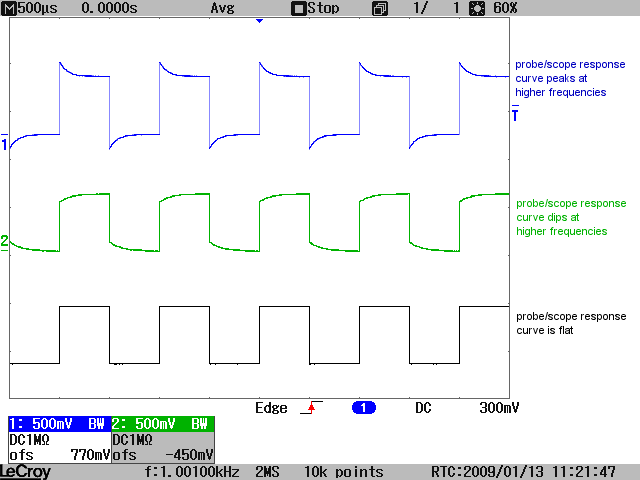 How often should I have to set oscilloscope probe's capacitance? Why is the calibration signal's amplitude of my oscilloscope 10 times higher than stated?